See Sharp Press, 9781937276874, 200pp. This new edition includes over 650 mordant definitions by Bufe—twice as many as in the original edition—and 40 illustrations by San Francisco artist and filmmaker J. R. Swanson. The definitions skewer such targets as religion, the "right to life" movement, capitalism, marxism, the IRS, politicians of all stripes, and common euphemisms, as well as male-female relations and sexual attitudes, something which Bierce, writing in more conservative times, was not free to do. The book concludes with a lengthy appendix of the best 200 definitions from Bierce's The Devil's Dictionary. 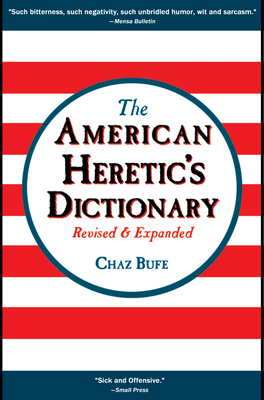 Chaz Bufe is the author, co-author, editor/translator, or compiler/editor of 10 other books, including" Alcoholics Anonymous: Cult or Cure?, ""An Understandable Guide to Music Theory," and" The Heretic's Handbook of Quotations." He has also written for dozens of magazines and newspapers, including "Eye," "Utne Reader," "Communities," and "New Times Weekly" (now "Phoenix New Times"). J.R. Swanson has been a professional illustrator since the 1980s. His work appeared regularly in the underground political magazine "Processed World," and also in the book "Bad Attitude "(Verso)."